With the upcoming departure of Marcus Mariota, I’d just like a moment to review and reflect on our beloved Skinny Hawaiian’s astounding career. In the coming days you will likely hear from ESPN how Mariota’s stock has fallen because of the Championship Game, and in the case of some, they might even say he shouldn’t be a first round pick now. Regardless of all of this they cannot take away what Mariota has already done for the Oregon Ducks football team and for all of us as fans. Mariota and Bennett walking out in Mariota’s first game. With how great he has been over the last three years a lot of us may have forgotten he wasn’t even supposed to be the starter. The supposed successor to Darron Thomas was actually Bryan Bennett. But as we now know, Mariota being the star in the making he was, beat out Bennett, forcing him to either switch position or transfer if he wanted playing time. With Bennett exiled to (my future college) Southeastern Louisiana and FCS Football, Mariota then proceeded to take College Football by storm, running for 752 yards while also throwing for 2,677 yards with 32 TDs to six INTs, as a freshman! Going into his second year there was some uncertainty as this would be the first year without Chip Kelly. In his first year with Mark Helfrich as head coach Mariota again played well, not facing any serious competition until running into Stanford, where Oregon lost its first game. After an easy win against Utah the Ducks stumbled again against Arizona. These two losses mixed with the emergence of Jameis Winston knocked Mariota out of any real shot at winning the Heisman Trophy, and in the end wasn’t even nominated. Nonetheless he finished the year 1,000 yards better than his freshman year, also throwing 31 TDs to four INTs. Then we came to the (almost) fairy tale like season he had this year. Oregon again started off hot early on, and Mariota was a Heisman candidate from the start. Despite a strong showing against Arizona, even scoring a receiving TD on a trick play, the Ducks fell to the Wildcats for the second straight year. Despite many injuries this loss would be the Ducks’ only loss of the regular season, as the Ducks overcame this to make it to the Pac-12 Championship Game where they got revenge on Arizona, winning 51-13. This propelled them into the first College Football Playoff, where the newly minted Heisman Trophy-winning Mariota, along with a dominant defense, gave Winston and FSU a thrashing to remember in the Rose Bowl. While this may be an end to Mariota’s career as a Duck, the impact he has made while here will not soon be forgotten. 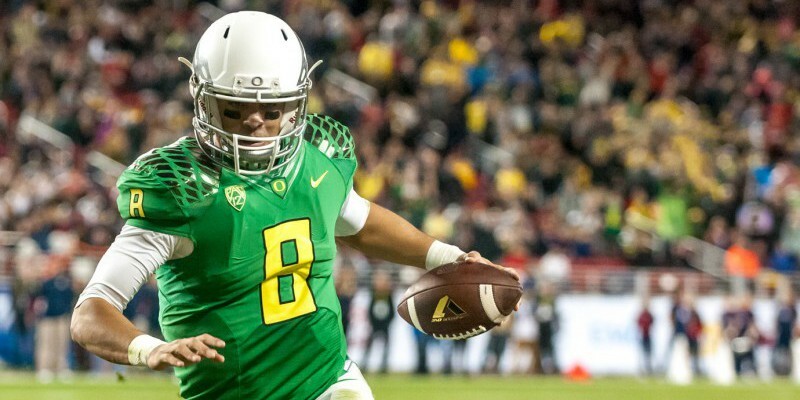 No matter what he does in the NFL he will always be both the first Duck to win a Heisman Trophy and the first Hawaiian-born player to win a Heisman Trophy. 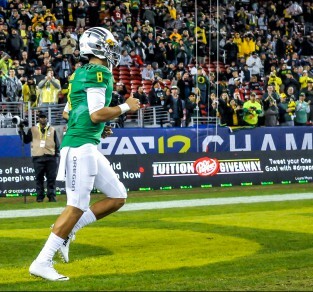 So in closing I say, while we may mourn the Ducks’ loss against Ohio State, we also should not forget the incredible season and career of one of College Football’s greatest players and Oregon’s brightest star, Mr. Marcus Mariota.